a much, much smaller jade plant remains (he’s the Benjamin Button of my plants, getting teenier each day). The lone survivor got smaller digs because I found a cute glass vessel thrifting that I thought would make him look less sad and lonely because the scale is more proportional to his tiny nothingness. I know he should have drainage and blah, blah, blah but the little guy should be happy I even remember to water him. 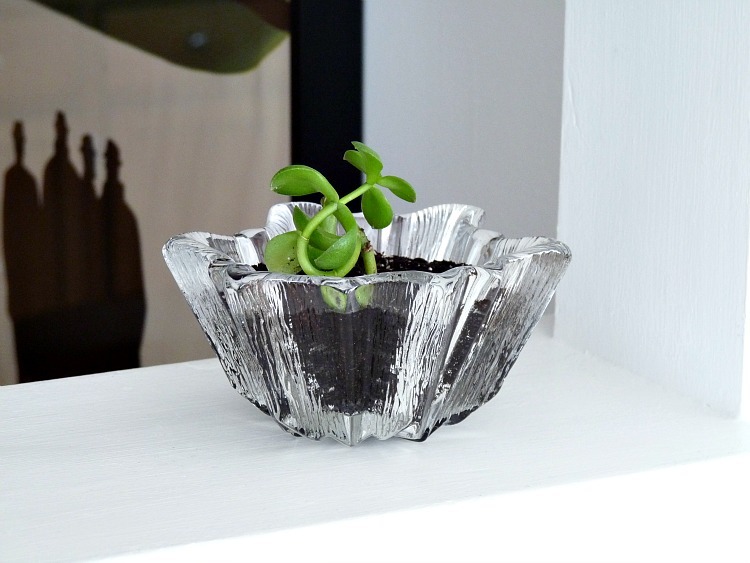 This teeny glass “planter” is melting my heart (and looks great with my Iittala collection below it). Look how many cute ideas there are for when a wee plant is all someone can manage . . .
Next Post No Dream House, Then Yes Dream House. It’s Ours! The cork idea is really cute. I may have to try that!I thought the "new digs" meant you were buying the house…What's the word? I'm the biggest tease. We went to see it yesterday. Details soon, I promise. Love it! 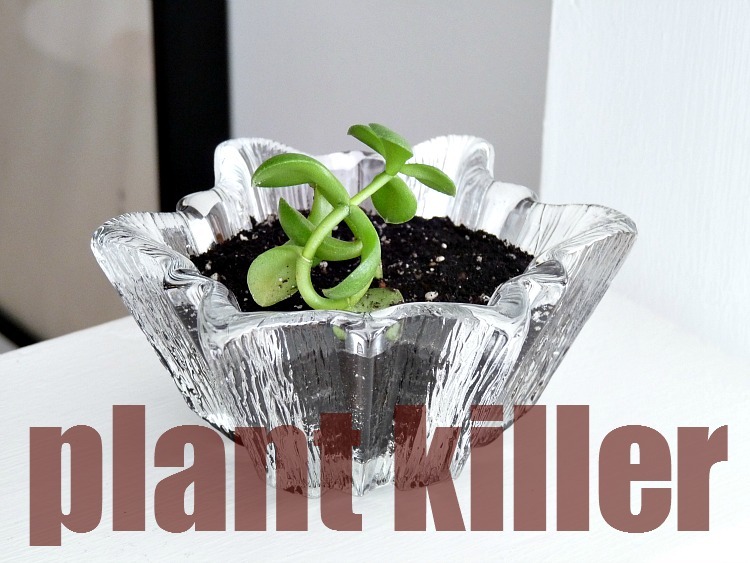 I'm a plant killer too… I'm not sure there's rehab for us!! This is why I love Lily of the Valley. They don't need sun and they muscle out every other plant in a garden. They are hardy and don't need me. My kinda plant. i thought this would be a new house post….crossing my fingers still?? I planted succulents in tiny containers and i love love love them. and so far they are still alive! Haha! Sorry! MONDAY, I promise! Your succulents died? That stinks! We never did house hunting! We found one, Hubby liked it, I liked it, details Monday! Try putting some stones in the bottom of the planter for drainage – it really helps! I really should, thanks for the tip! Well, I'm glad I'm not the only one naming her plants with alliterations. So far we have Greg the Gardenia and Charles the Chives. We started with Bob the Peace lily, but somehow that just didn't sound well. I like the tiny plants ideas, although the corks might be a little overkill (literally). I love those names! Charles is my favorite. It's true… you're killin' us here. 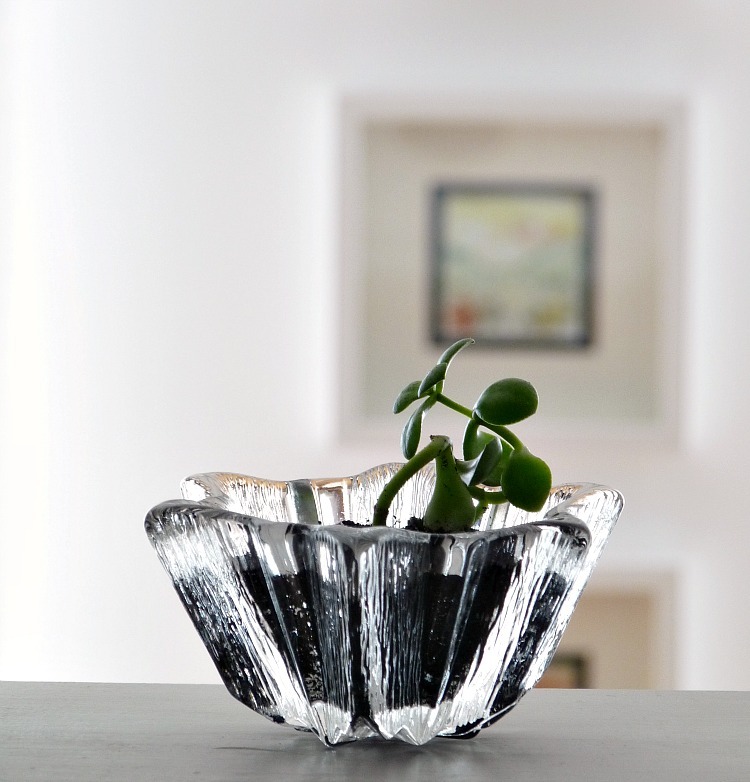 I thought you meant you were getting the lakehouse!Lovin' the mini plants… the jade is nice in that glass planter. 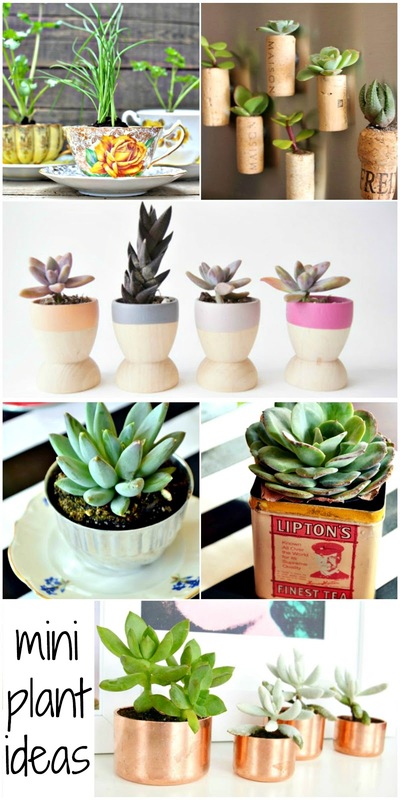 Whenever I see little pots of succulents on pinterest I get a crazy. I want to recreate them all even though I have no more good light locations. I copied an idea in a design magazine using succulents in 4 white espresso cups. Turned out cute and I paid more for the tiny plants than I did for the cups that I found at Goodwill. Don't feel too guilty about the plants, it likely has less to do with you than it does the house (another reason for the lakehouse- it looks like it has good light). Natural light and humidity make a bit difference from house to house. And more plants die due to over watering than under watering. Although, I have done that more times that I should admit. Yes, let's blame this house!! It is pretty windowless. Darn townhouse.Monday I will spill all of my beans. I LOVE those copper caps! Great ideas here! Isn't that clever?? I've walked by those caps so many times at the hardware store (I even bought some for another project). But it never would have dawned on me to use them for that!